SAB Presents "Bill Nye the Science Guy"
The 5 Browns, a sibling quintet of piano players, are the final performers in the 2009-2010 Kohlenberg Lyceum Series. They will perform at 7:30 p.m. April 8 in Baldwin Hall Auditorium. Tickets will be available April 1. Delivering on their dream to wake up classical music, The 5 Browns are introducing it to the widest, largest and most excited audience they can find. The 5 Browns reveal a deep connection to their material while bringing a fresh energy and dynamic character to the color and tonal spectrum of their sound. The 5 Browns – Ryan, Melody, Gregory, Deondra and Desirae – all attended New York’s Juilliard School. In fact, they became the first family of five siblings ever accepted simultaneously. The quintet enjoyed their first wave of critical attention in February 2002 when People magazine dubbed them the “Fab Five.” At about the same time, they were featured on Oprah and 60 Minutes. The 5 Browns have released three CDs that each went to No. 1 on Billboard Magazine’s Classical Album Chart. The quintet has garnered extensive coverage from media outlets ranging from the Tonight Show with Jay Leno and Today, to the New York Times, the Sunday London Telegraph and Entertainment Weekly. In addition to touring, The 5 Browns are published writers. Their book, “Life Between the Keys,” was published by Phoenix Books in March 2009. This April will see the release of their new CD “The 5 Browns … In Hollywood,” on the E1 Music label. They are also featured in a new PBS TV special, “The 5 Browns In Concert,” which airs on PBS stations across the country. Tickets are free for Truman students, faculty and staff with a Truman ID. Students may pick up their tickets at the Student Activities Board office in the Student Union Building. Faculty and staff may pick up their tickets at the information desk in the Student Union Building. For more information, visit http://www.the5browns.com or http://lyceum.truman.edu. The allure of a sunny, beach vacation did not keep some Truman students from volunteering during the University’s midterm break. Approximately 360 Truman students participated in service trips through various organizations on campus. Twenty-two members of Alpha Phi Omega went to Great Smoky Mountain National Park in Gatlinburg, Tenn. While there, members worked with the National Park Service crew clearing trails. The Baptist Student Union took 12 students to Memphis, Tenn., during break. Students worked to renovate a summer camp and volunteered at a senior center. Campus Christian Fellowship took 225 people to Sophia, N.C., where the group worked to fix up Camp Calloway, a boys camp. Students cleared trails, raked leaves, split wood, hauled mulch, repaired windows and roofs, built picnic tables and constructed a disc golf course and a paintball field. Students representing the Catholic Newman Center helped rebuild a town in Arkansas that was destroyed by tornadoes more than one year ago. Approximately 25 students participated. The Flame Ministries did Hurricane Katrina relief work with a New Orleans church, and 16 students participated. Habitat for Humanity students visited Biloxi, Miss., where a 25-person group worked with a Habitat affiliate to do construction in a neighborhood of Habitat homes. One student volunteered for Habitat for Humanity in Jefferson City by painting a home with others from the area. In San Francisco, 22 Lutheran Student Fellowship students completed various projects including beach clean-up and work for Habitat for Humanity, a food bank and a children’s museum. Members of Truman’s Pi Kappa Phi Chapter volunteered through the fraternity’s philanthropic organization, Push America, at Camp Twin Lakes in Rutledge, Ga. Sixteen Truman students joined others from schools around the country to build an outdoor amphitheater and wooden benches. Phi Kappa Tau will conduct the 15th annual Cookout for Kids April 13 to support camps for children with chronic or terminal illnesses. In the run up to the event, Phi Tau members will be taking lunch orders for barbecued meals, which will be delivered April 13. This year’s menu features either a barbecued half chicken or pork steak, with side orders of baked beans, coleslaw, bread and a soda for $8. Proceeds from Cookout for Kids go to the Hole in the Wall Gang Camps for children with chronic or terminal illnesses. The camps were originally created by actor and philanthropist Paul Newman, a Phi Tau alumnus, in 1988. They provide one-week camping experiences for children that require around the clock care and frequent hospitalization. Today there are more than 10 Hole in the Wall Gang Camps operating in five states and seven countries, and eight additional camps are in the development phase. While it cost, on average, $2,100 to send one child to camp, Hole in the Wall Gang Camps do not charge the families. It is only through contributions and donations the camps are able to host the children. In the last three years, Truman Phi Tau members contributed more than $5,000 to the Hole in the Wall Gang Camps. To place an order, or to request an order form for an office or organization, call 816.686.0285 or e-mail Ralph Cupelli at rcupelli@truman.edu. Order forms are also available in McClain Hall 203. For more information about the Hole in the Wall Gang Camps, go online to http://www.holeinthewallcamps.org. Kirksville Sigma Xi, an honorary scientific research society with local membership from Truman and A. T. Still University, is bringing Dr. Jessica Nunez de Ybarra to campus April 1-2 for several events. Ybarra works at the State of California Department of Public Health in the Division of Communicable Disease Control in the Office of Workforce Development as a public health medical officer coordinating public health training and emergency preparedness activities. She is also the Division’s liaison to the California Public Health Law Workgroup. She has a medical doctorate from the University of California, Davis and received her master’s in public health in health services administration from the University of California, Los Angeles. She is board certified in public health and general preventive medicine. At 12 p.m. April 1 in the ATSU Couts Classroom, Ybarra will give a lecture on Rural Public Health and Aging. At 7:30 p.m. April 1 in the Student Union Building Alumni Room, Ybarra will present “Challenges of Public Health” as part of the Global Issues Colloquium. The “Challenges of Public Health” presentation will discuss the mission of public health in the United States, which is the fulfillment of society’s interest in assuring conditions in which people can be healthy. This mission can be daunting in an ever-changing world with constant emerging threats and resource limitations. The lecture will discuss a few of the directions the field of public health is heading, with lessons from the past and future improvements, including soliciting community input and partnership. Risk communication and the importance of translating scientific results into policy that are communicated clearly to the public are emphasized. A breakfast reception for students interested in public health careers will take place at 8 a.m. April 2 in the Student Union Building Spanish Room. The same day there will be a roundtable lunch discussion on local public health issues at 12 p.m. in the Student Union Building Spanish Room. Members of the discussion panel include Ybarra and Rep. Rebecca McClanahan, among others. Events are sponsored by Sigma Xi in conjunction with the Global Issues Colloquium, the Provost’s Office and GlobeMed. The Kirksville Sigma Xi Chapter, founded in 1989, represents a cooperative venture between Truman and ATSU. Membership is open to those with an interest in scientific research. For more information, visit the Sigma Xi website at http://sigmaxi.truman.edu/ or call Amber Johnson at 785.4322. 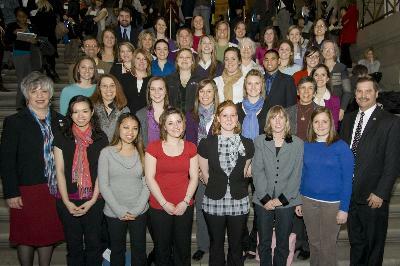 Nursing students and faculty members spend time with Sen. Wes Shoemyer and Rep. Rebecca McClanahan inside the Capitol in Jefferson City, Mo., Feb. 24. Five nursing faculty accompanied 34 seniors to the 24th Annual Missouri Nurses Association (MONA) Nurse Advocacy Day, “From Advocacy to Policy,” at the Capitol Plaza Hotel. Fourteen Truman international students, representing nine different countries, shared information about their home cultures with nearly 200 children from the Memphis, Mo., area during “All School Family Fun Night” at Scotland County Elementary School March 18. Each year, Truman international students educate area students and their families during Scotland County Elementary’s “All School Family Fun Night.” The international students shared their cultures through games and stories. The International Student Affairs Office has been partnering with Scotland County Elementary and its principal, Rhonda McBee, for the past few years in participating in one “All School Family Fun Night” every spring. 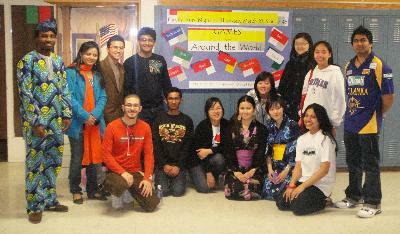 Students from India, Nepal, Sri Lanka, Vietnam, Japan, China, Nigeria, South Korea and Egypt presented information about their home cultures and taught students and their parents children’s games from their countries. Some of the games included: Cricket; Aliyaya Aha Fuabuma, a Sri Lankan game similar to “pin the tail on the donkey,” only its “pin the eye on the elephant”; Ifo, a Nigerian game similar to hopscotch; and Gong-gi, a South Korean game similar to jacks. Chinese students hosted a marshmallow/chopstick relay, while Japanese students conducted origami sumo wrestling. The ISAO participates in the program to share international cultures and promote diversity among children in the rural Midwest, as well as to give international students an opportunity to interact with American children and learn more about childhood in the United States. College Media Advisers (CMA) named the Index and Detours magazine “Best in Show” for their respective categories at CMA’s National Spring Convention in New York City last week. “Best in Show” winners receive the CMA Apple Award. The Index won for best non-daily broadsheet student newspaper and Detours won for general interest student magazine. The Index submitted its Jan. 28, 2010, edition for this year’s competition. That edition included front page coverage of Provost Troy Paino’s presidential forums. The Index has won CMA’s “Best in Show” Apple Award five times since 2003. Detours has now won the Apple Award three times since 2006. The magazine submitted its Winter 2009 edition for this year’s CMA judging. The Missouri Insurance Education Foundation will award scholarships to deserving students attending Missouri colleges or universities in a program that could lead to positions in the insurance industry in Missouri. The $2,500 C. Lawrence Leggett Scholarship is awarded to a junior or senior Missouri resident majoring in insurance or a related area of study in a Missouri college or university. In addition to the Leggett Scholarship, the foundation has made an additional scholarship available in the amount of $2,000. Applications are available online at http://www.mief.org and due March 31. The Jack J. Isgur Foundation is accepting applications from students enrolled in the field of education in the humanities, such as literature, fine arts, music, art, poetry and dance. The Foundation awards scholarships to students studying at colleges and universities who indicate an interest in teaching courses in the above-described areas in school districts located in the State of Missouri, preferably rural school districts. The scholarship is available to those at the junior and senior levels, as well as graduate students. For further information, and an application, stop by the Truman State University Financial Aid Office. Deadline for submission is April 15. The Foundation of the Stadium Managers Association (SMA) offers its student scholarship to provide tuition assistance and an opportunity for outstanding students currently enrolled in an accredited sports management and sports administration programs with an emphasis on facility and/or event management to learn more about the professions through networking with leaders in the field in an educational and information setting. This $2,500 annual scholarship award includes student membership in the SMA. For an application and more information regarding this scholarship go to http://www.stadiummanagers.org, click on Foundation. Application deadline is April 15. The William M. Reiss Foundation is offering scholarships to graduates of publicly supported high schools located within the city limits of Belleville, Ill. Official college transcripts are required and a copy of the Student Aid Report from the FASFA is recommended. Stop by the Financial Aid Office at McClain Hall 103 for more information on how to apply for this scholarship. Deadline to apply is May 1. The John Gyles Education Awards are available each year to students in both Canada and the United States. They are the result of a private, benevolent endeavor established in 1990. Full Canadian or American citizenship is a requirement. Awards are available to both male and female students for all areas of post secondary study. A minimum GPA of 3.0 is required. Criteria other than strictly academic ability and financial need are considered in the selection process. Selected students will receive up to $3,000. The filing date for mailing applications is May 1. Applications are available online at http://www.johngyleseducationcenter.com. The Public Relations Office is now accepting résumés for the full-time Fall 2010 internship position. Interns can receive course credit, a stipend and valuable experience in public relations office duties. Interns usually take six hours of class in addition to six hours of internship credit. Applicants should have a strong background in writing and editing. Communication majors are encouraged to apply, with special consideration given to candidates with knowledge of Associated Press style, experience in desktop publishing and familiarity of InDesign or similar software. To apply, send a résumé, two writing samples and contact information for two on-campus references to the Public Relations Office, McClain Hall 101, by April 9. For specific questions about the internship, contact Heidi Templeton at heidi@truman.edu. The Center for Student Involvement is currently hiring scholarship and work study students for the 2010-2011 academic year. Apply online through TruPositions. Interviews for the available positions will take place in early April. The SERVE Center is hiring for student assistant positions via TruPositions. Applications will be accepted through April 9, and successful candidates will be notified of interview times for the week of April 12. Apply at https://trupositions.truman.edu. The Truman Success Center is currently hiring tutoring scholarship and work study students for the 2010-2011 academic year. Tutoring will take place both in the Success Center and the Multi-Cultural Affairs Center. Apply online through TruPositions. Interviews for the available positions will take place this semester. Students are asked to apply as soon as possible to tutor their best subjects. Check out the Success Center website for more information on the center at http://successcenter.truman.edu. Upward Bound is seeking residential mentors for summer 2010. Application reviews will begin immediately and continue until positions are filled. Application packets and information are available at http://ub.truman.edu or call Donna at 785.4244. The Candidate Forum, which originally took place March 25, was recorded and edited by News 36. It included the School Board candidates and the City Council candidates addressing questions from a media panel. KTRM also recorded the forum and will re-air it at 6 p.m. April 4. For more information, visit http://ktrm.truman.edu. Exchange ideas, find new collaborations, and define the future of service in Kirksville. There will be roundtable discussions between campus leaders and community agencies - separated into interest areas. Each area will define key issues to be addressed and future service and service-learning projects. RSVP to bcloyd@truman.edu or 785.7753. If you do not RSVP but would still like to attend, please come. Sponsored by the Center for Teaching and Learning and SOAN 265. The group will depart Truman at 4 a.m., taking a bus to Quincy, Ill., to board an Amtrak Train into Union Station and take the same route back to return at about midnight. There are 50 spots (40 for those going to the Cubs game and 10 for those not going to the game) available. Sign up now at the Student Union Building Information Desk. For more information, contact Brian Krylowicz at briank@truman.edu, Tyler Madsen at madsen@truman.edu, Rhonda Hampton at rhampton@truman.edu or Zac Burden zburden@truman.edu. Tickets are free with a Truman ID. General admission is $5. Come cheer on the athletes, hang out at Olympic Village between events and work one-on-one with athletes. Grab a friend, put on a smile and sign up to be a buddy for the Spring Special Olympics in Kirksville April 17. If interested, e-mail Lara at lkl8154@truman.edu. Don’t forget to complete the 2010 Census form. Students living off-campus received forms in March to be returned in the provided envelope. Students living on-campus, or in a fraternity house, will receive a form in April or May to be returned to a designated site on campus. The Pearson Prize is a new student leadership award that recognizes and provides support to exemplary students who are distinguishing themselves by leading public service efforts. The Pearson Prize will recognize 70 undergraduate students for exemplary community service, providing 20 students with financial assistance/support and 50 more with a single one-time cash grant. For more information, and to apply, visit http://www.pearsonfoundation.org/pearsonprize. Applications are due April 11. File the 2010-2011 FAFSA located at http://www.fafsa.gov before April 1 to be considered for all available funding. For more information, visit the Financial Aid Office, McClain 103, 785.4130. The Student Union will be accepting reservation requests for the fall semester starting March 29 until 5 p.m. April 1 online at http://emspro.truman.edu. Paper requests may also be submitted during this time. The lottery tab will be made inactive after April 1, and all other requests will need to be submitted in writing to the SUB Administrative Office in SUB 2000. Anything coming in after April 1 will be processed on a first-come, first-served basis. Paper lottery forms can be found online at http://studentunion.truman.edu/lottery. These forms can be submitted during the lottery time to the Administrative Office. All policies, charts and forms will be available online at http://studentunion.truman.edu/lottery starting March 29. More information will be mailed to offices, departments and student organization mailboxes in the CSI, as well as e-mailed to student organization contacts. A representative from Apple will be on campus for a hands-on demonstration to show how Apple products can assist educators to reach a modern, media-centric student and help students achieve their educational and career goals. Today’s students are learning in more places than just the classroom, and educators are finding new ways to reach them anytime, anywhere. Apple products help make teaching and learning more engaging and accessible than ever. At the event, faculty, IT managers and departmental leadership are invited to learn how Mac, iPod and iPhone make collaboration, content creation and content distribution easier. Register online at http://csi.truman.edu or stop by the CSI Office in the Student Union Building. Organizations that register by April 20 are eligible to win a $25 CSI credit. There is a $1 registration fee. For more details, call the CSI at 785.4222 or e-mail csi@truman.edu. RSVP for the event http://senate.truman.edu/eoy/EOY-RSVP.htm. All proceeds go to the American Cancer Society’s Relay for Life. Sponsored by Phi Epsilon Kappa. Michael Goggin, associate professor of physics, recently attended the March Meeting of the American Physical Society in Portland, Ore., at which he was a co-author of an abstract entitled “Towards Quantum Chemistry on a Quantum Computer,” that was chosen as one of 32 highlighted abstracts and one of 40 abstracts chosen for the image gallery. Goggin conducted the experiment, in collaboration with a theory group at Harvard University, while he was on sabbatical at the University of Queensland. It reports the first experimental implementation of a proposed quantum algorithm for calculating the energy spectrum of a molecule. The March Meeting is the largest physics meeting in the world, attended by more than 10,000 physicists presenting more than 7,500 papers. More information about the experiment can be found online at http://www.msnbc.msn.com/id/35187725/ns/technology_and_scienceinnovation/. Justice Systems recently sent a delegation of five students to the 73rd National Conference of the American Criminal Justice Association (Lambda Alpha Epsilon) in Portland, Ore. This conference brings together students, academicians and criminal justice professionals from around the country. Of particular interest at this year’s meeting was how to improve national security by bolstering port and air safety measures. In attendance were students Jake Hart, Nick Schmidt, Jamey Schuster, Tanner McMillin and Emily Smith. Students participated in academic, physical agility and firearm competitions and also attended various workshops and the association’s business meetings. Schuster was awarded a first place trophy for Police Management (an upper division academic competition) and Smith received a second place trophy for Physical Agility (female under 25 years of age). Lynn Rose, professor of history, translated and wrote commentary on “Anonymous, On Carthage (744),” for Brill Online, February 2010. The entry is scheduled to “go live” in April. The piece is a 22-page translation from Ancient and Byzantine Greek, Latin and German, along with historical and literary commentary. Bridget Thomas, associate professor of classical studies, helped with a lengthy embedded passage by Theodoros Metochites, a Byzantine theologian. “Anonymous #744” is part of a larger project that will put all 800-plus ancient Greek historians, whose work is extant in fragments only, online with English translations. Until now, the fragments have been in an unwieldy, multi-volume collection with a German translation. Advertising and Public Relations Organization and Lambda Pi Eta are hosting speaker Matt Hall, vice president of external communications for Hanes at 7 p.m. March 30 in Barnett Hall 1211. This event is part of Communication Week. Donna Rhinesmith, professor of education, will conduct the Faculty Forum at 7 p.m. March 30 in the Student Union Building Georgian Room. Rhinesmith will present results of her research on Controversial Children’s Literature in the Classroom. She has examined children’s literature that has been controversial in schools on political, religious, sexual and social grounds. Faculty, students and the public are invited. The Weekly Lunch Series continues at 12:30 p.m. March 31 in the Student Union Building Spanish Room with the third of three events featuring the annual Academic Integrity series on copyright, plagiarism, FERPA and more. Also, a representative from Apple will conduct a hands-on workshop about Apple educational tools. Alpha Phi Omega is hosting a Blood Drive from 10:30 a.m.-5:30 p.m. March 31-April 1 in the Student Union Building. The Physics Colloquium will continue at 4:30 p.m. March 31 in Magruder Hall 1096. The speaker is Kishor T. Kapale from Western Illinois University who will present “Orbital Angular Momentum of Light for Fun and Profit.” For more information, visit http://physics.truman.edu/colloquia/mainstage.asp. The National Communication Association Student Club is hosting a movie and discussion featuring “Thank You for Smoking” at 7 p.m. March 31 in Barnett Hall 1211, as part of Communication Week. The School of Health Sciences and Education have invited senior Mark Couch to discuss his experiences in China at 7 p.m. March 31 in Violette Hall 1320. Couch has spent a year in China, one semester as an intern in Shuizhai under the sponsorship of the Department of Education and the Department of Classical and Modern Language, another teaching English in a private academy in Guangdong Province. MAE students, counseling students, and those interested in languages or ESL, are particularly invited to attend. The Stargazers Astronomy Club will host an Observatory Open House from 8-10 p.m. March 31-April 3 at the University Farm. Students in COMM 357, Survey of Rhetoric, invite the public to an April Fool’s celebration during Communication Week. The class will perform at 1:30 p.m. April 1 in Barnett Hall 1215. Students were challenged by Barry Poyner, professor of communication, to write a dialogue defending rhetoric’s utility and status as an art while simultaneously outwitting Socrates. Students in Free Enterprise (SIFE) will host “Summer 2010 Opportunities for International Students” at 7 p.m. April 1 in Violette Hall 1300. The event will explore opportunities for summer employment on and off campus and will feature presentations by the Career Center and the International Student Affairs Office. The Global Issues Colloquium Series concludes at 7:30 p.m. April 1 in the Student Union Building Activities Room. Sigma Xi will sponsor speaker Jessica Nunez de Ybarra MD, MPH, of the California Department of Public Health, who will discuss The Challenges of Public Health. In addition to discussing a few of the directions the field of public health is heading and looking at lessons from the past, Ybarra will stress the importance of translating scientific results into policy. SIFE and Truman’s Success Center will be teaming up to give a presentation on Surviving Last-Minute Group Projects at 8:30 p.m. April 1 in Violette Hall 1140. The Missouri Rural Enterprise and Innovation Center is sponsoring a presentation, “Obtaining Government Grants for Innovative Research” at 12 p.m. April 2 at the Kirksville TCRC (315 S. Franklin). Learn how to seek out, apply for and obtain federal funding to potentially commercialize your innovations. Call the MREIC for more information or to register at 785.4307. The American Association of University Professors (AAUP) will meet at 4:30 p.m. April 2 at the University Club House, located at 516 E. Patterson. Contact Marc Becker at marc@truman.edu or call 785.6036 for more information. Phi Epsilon Kappa’s Relay for Life Team is hosting Glow Stick It to Cancer at 8:30 p.m. April 13 at Stokes Stadium. All proceeds are donated to American Cancer Society. This event is a two-mile fun run/walk with glow sticks on the Stokes Stadium track. Registration will start at 8:30 p.m. and participants who did not pre-register can buy t-shirts while supplies last.